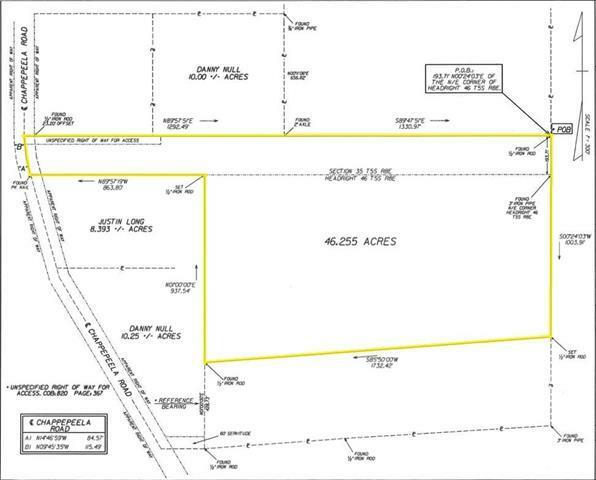 46.255 acres in Loranger with over 184 Ft of Frontage on Chappepeela Rd. See map attached on MLS. All measurements are approximate in the mls of land. Seller to provide a new survey prior to the act of sale. Property dimensions are as follows: 193 frontage on Chappepeela Rd, left side depth 2623 ft, rear is 1003.91, right side is 1832.42 and it has 937.54 that turns north and then 863.80 feet turning west back to Chappepeela Rd. See attached survey.